The longer we play video games, the more likely we are to recognize a very apparent problem with our industry, the curation of video games. When you look at any other art form, its content is easier to access than video games. Movies have run into some slight issues due to the differences in filming methods over the years. Not only do we no longer use acetate film stock, but many digital theaters are phasing out projectors altogether. But that technology issue is even more apparent in video games. And instead of taking 50 years between every large leap in technology and format, we are dealing with a maximum of 10 years between console generations. When you are young, or outside of the industry, that may seem like merely an issue of nostalgia. But it’s a larger issue when it comes to learning from the games of our past. So we are stuck with companies using time and resources to resurrect important or popular games from our past. 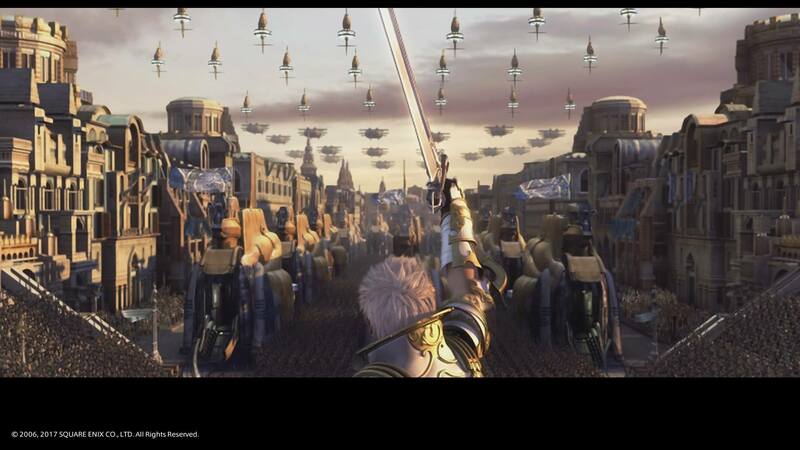 And that is where we come to this game review: the next game that Square Enix has chosen to remaster is Final Fantasy XII. So there are three pertinent questions to ask: why was this game chosen, is this the definitive version of the game, and how does the game hold up when looked at again years later? The archetype for this story is not the classic hero’s journey. There is no way around the fact that the original game is very divisive among the general gaming public. It was not very divisive among the reviewers—it was almost universally praised—but the public seemed to either really love it or really hate it. In my observation there seems to be a fairly common thread between that division, at least for those who bothered to play through the game and not just judge it by first appearances. Honestly, it seems that the more educated the player is, at least with the classics of literature and history, the more likely they are to enjoy this story. That’s not to cast aspersions upon the people that don’t like it—it’s merely an observation of a trend. And there is good reason for that trend. Unlike other Final Fantasy games, this one really does not focus on the classic Hero’s Journey style of story. 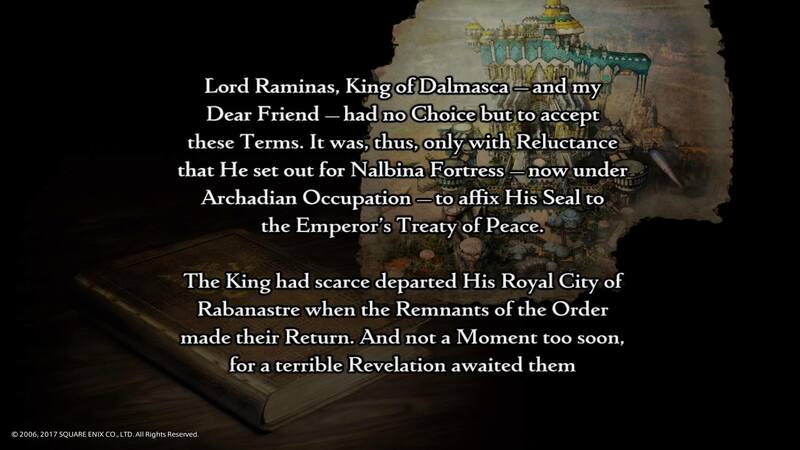 Instead, this is an epic tale of kingdoms, politics, and history more akin to Shakespeare and Tolstoy than the more common tales you see in video games. Really the only two Final Fantasy games that have been similar in story have been Final Fantasy VI and Final Fantasy Tactics. Of course, as a result this can seem a bit dense, boring, and impenetrable to some people, almost like they have been given homework instead of playing something for enjoyment. The backstory is very detailed and voluminous, but well worth the attention. That Shakespearean feel also extends to the dialogue, which most of the time plays out similar to some of the Bard’s more popular plays about kingdoms in conflict, such as King Lear. There are enough similarities in the dialogue that I would suggest that if you do not like old books or plays, you may be turned off from the game altogether. But for those of us who love that style, we almost never see it in any video games, and it is like manna from the heavens directly into our ears. The localization of this game has remained famous all these many years after the initial release of the game, and so this remake has given a new opportunity to hear it again. Even though video game voices have improved drastically since the PlayStation 2 era, I still have to list this as one of my favorite dubs ever. One of the major advantages of having dense dialogue is that there is a lot to unpack and it retains value in replay. The new Job license boards have several abilities that can only be accessed by certain conditions. The other two controversial aspects of the original game were the Gambit system and the License Board. 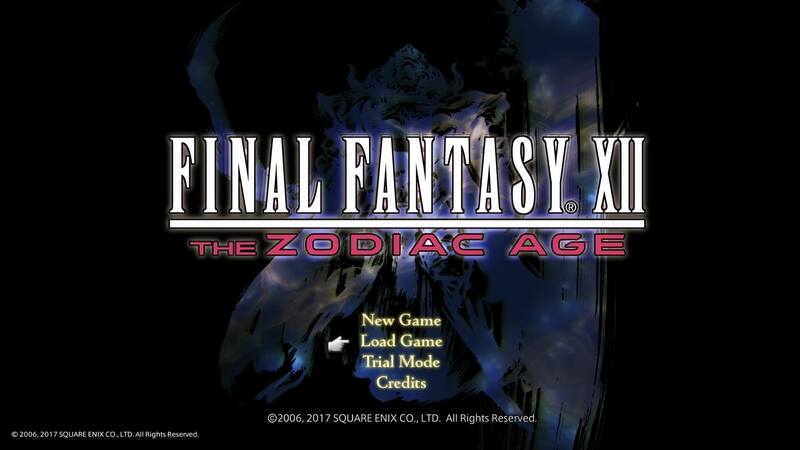 The Gambit system is exactly the same as the International Zodiac Job System of the game, but that only has a few new commands from the original release of Final Fantasy XII. The Gambit system is a set of programmed commands that you can give to your party members to activate a series of ‘If/Then’ commands based on both player actions and enemy actions. While it seemed to many to cede control of your characters to the computer, it was actually quite the opposite. It is actually quite necessary for you to take manual control of your characters when unexpected events happen and for positioning purposes, but what the Gambits allow you to do is avoid micromanaging everything at every second (because combat is typically much more involved than it used to be). It also allows your party, even the ones that you are not directly controlling, to react very fast to changing situations. It’s somewhat ironic that both Final Fantasy XIII and Final Fantasy XV offer far less control over your party member’s actions, but there has not been nearly as much outcry about that from most sectors. 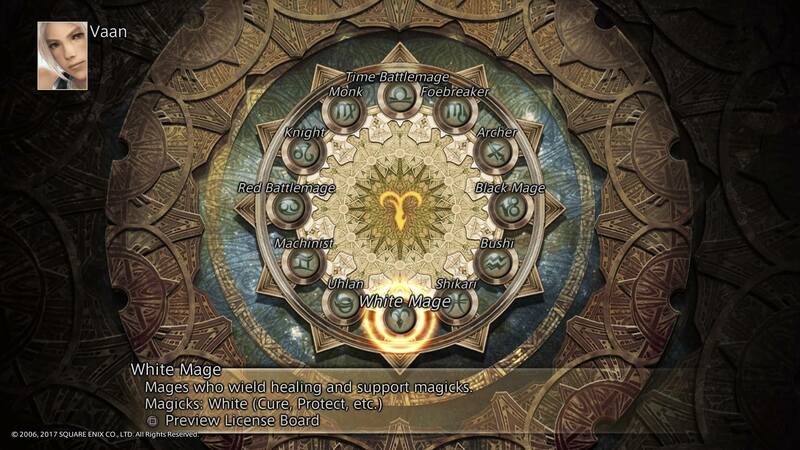 Playing Final Fantasy XII again only served as a reminder about how ahead of its time the Gambit system was, and how much I wish I had those controls in other games. Choose your Jobs wisely—you have two choices, but neither can be undone. The International Zodiac Job System version of the game added Jobs into the game to address the last general complaint about the game. People felt that a shared License Board made it feel like all the characters were the same and that they could be a master of everything. In actuality, anyone who really dove into the game understood that the License Board did not make anyone overpowered or too similar. The main reason for that was because the License Board did not really increase a character’s power all that much, it just opened options for you to be able to use. But it was really equipment that determined your stats more than anything else. For instance, cloth armor increases your MP and your Spell Power, leather armor increases your HP and your Attack Power, and heavy armor increases your HP and defense. Likewise with the weapons—they drastically alter your stats and the way that you will want that character to play. This is still largely the case, but the Jobs were made to feel very different, so there is a lot more power to be gained from the Licences. There were only 6 Battle Lore and Magic Lore (which increase your attack and magic damage) on the original License Board, but now you can have up to 16. 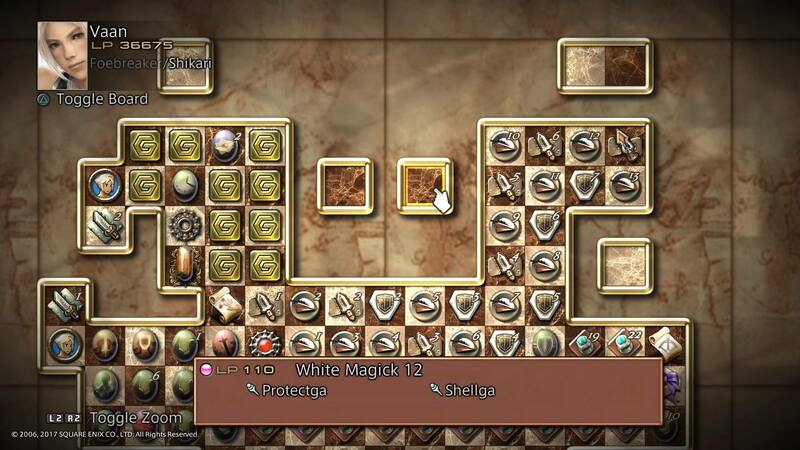 There are also a lot more HP increases and general abilities that you can unlock. They also added a couple brand new abilities, and of particular note (and power) are the statistic debuff abilities that are native (but not exclusive) to the Foebreaker Job. While those new skills are not necessary for the general game, they are highly valued for the elite content.